A sonar scan showing the car under 10 metres of water at Borumba Dam. FISHERMAN Terry Allwood had shivers when he learned he had inadvertently done what police had been attempting for more than a decade. A glimpse at the screen of his electronic depth sounder when idling away from the shore at Borumba Dam has led to a major breakthrough in a 13-year missing person case. 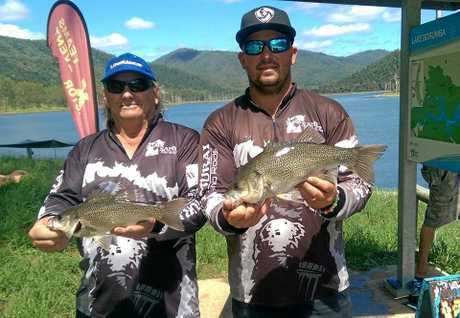 Mr Allwood, of Wondai, was competing in the Basstasstic fishing tournament on March 25 when he made the find. He was heading out for an afternoon session of competition and had only idled a short distance from shore. "I saw the shape of it on the panel and went 'sh**, that's a car'," Mr Allwood said. He immediately marked the position on his GPS and then circled round, using his Lowrance HDS-10 Gen 2 fishfinder to capture different angles of it. Other competitors joined in, with some able to see it and others not. "I thought 'someone has knocked a car off and just dumped it'," Mr Allwood said. His wife reported the find to police that evening and an officer came out to the dam to meet them the next day. The car was about 30m from shore, about 10m below the surface. Mr Allwood said he wasn't too worried about the find until he got a call from police on Thursday afternoon saying the find was linked to a missing person case. Police divers and Clayton's Towing had retrieved the same red VL Holden Commodore in which missing person Stuart Gatehouse had last been seen. There were skeletal remains inside. "When the guy on the phone said there was a missing person from 2004, I just had goosebumps." Police have not yet confirmed the identity of the remains found. "I probably would have rather not known," Mr Allwood said. "It's a really crazy feeling. "I feel happy the family of old mate can get some closure." 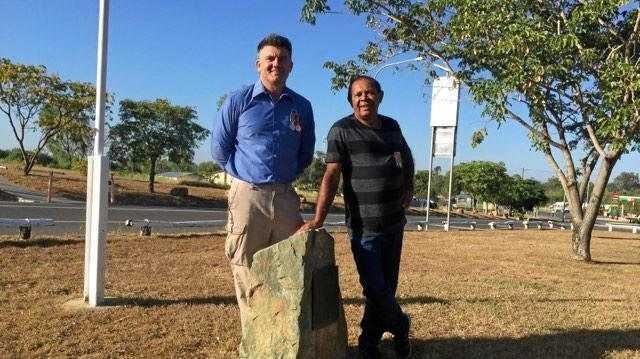 Sunshine Coast Crime Group officer Detective Inspector Dave Drinnen said the State Coroner handed down findings in 2012 that Mr Gatehouse was dead, but had no details on where, when or how his death had occurred. Mr Gatehouse, from Tasmania, had been living in Kenilworth and was heading north to see a family member when he disappeared. "His father, who was in Tasmania, he reported him as a missing person, obviously concerned for him that he didn't show up when he was going to visit his brother," Det Insp Drinnen said. Mr Gatehouse would have turned 58 on Thursday. "There were no leads back then that someone was responsible for the death of Mr Gatehouse," Det Insp Drinnen said. "However... we will review the investigation report (and) have a look at that with the new information we now have." Det Insp Drinnen said police were also hopeful of providing some closure to Mr Gatehouse's family. "It's something that the family has had to live with for an extremely long period of time." He said results of forensic examinations being conducted on skeletal remains in the car would need to be finalised before they could confirm whether or not they had found the man missing for 13 years. He would neither confirm nor deny reports a gun was also retrieved from Mr Gatehouse's car. "At this stage it is far too early in the investigation to be making any speculation as to who the deceased person that was located in that vehicle," Det Insp Drinnen said. Anyone with information which they believe could be relevant to the investigation is urged to contact police or Crime Stoppers on 1800 333 000.